This is a standard Nuremberg diptych dial by the well known maker Paul Reinmann following the technical designs published by Georg Hartmann. The compass is a replacement with the card signed by E. Ch. Stockert, a German sundial maker in the 18th century. 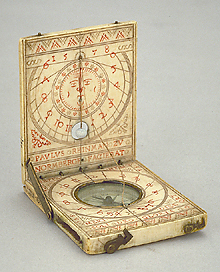 The instrument contains a wind rose and a vertical and horizontal string gnomon dial.